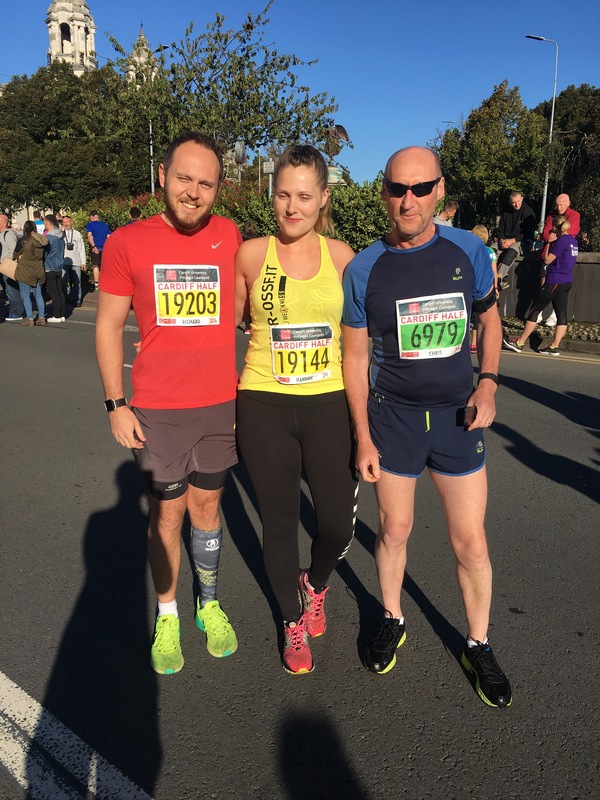 The dreaded weekend of our half marathon was upon us and we were in high spirits that we would complete it and complete it within our estimated time of 2 hours 30 minutes (based on our training runs). After waking up relatively early (way to early for a Sunday anyway) we had our breakfast of porridge & made our way into the centre. It was surprisingly chilly although not a cloud in the sky could only mean one thing – it’ll be a hot one & it was. After posing for the obligatory pre race photos, Hannah and I ventured into our pen and Hannah’s dad, Chris ventured off to his. Chris was expecting to be close to the 2 hour mark(!!) so started further down towards the starting line. Our race got off to an interesting start, running over the line with a bloke dressed in full armour – yes medieval style armour!! Unfortunately 2 miles in my calf & hip started to hurt, luckily I’ve experienced this before in our training but this time it wouldn’t go. Fortunately with a lot of encouraging words from Hannah I pushed on and it seemed to ease just before we got to mile 3. As we turned the corner, we saw something we weren’t expecting to see… a hill. 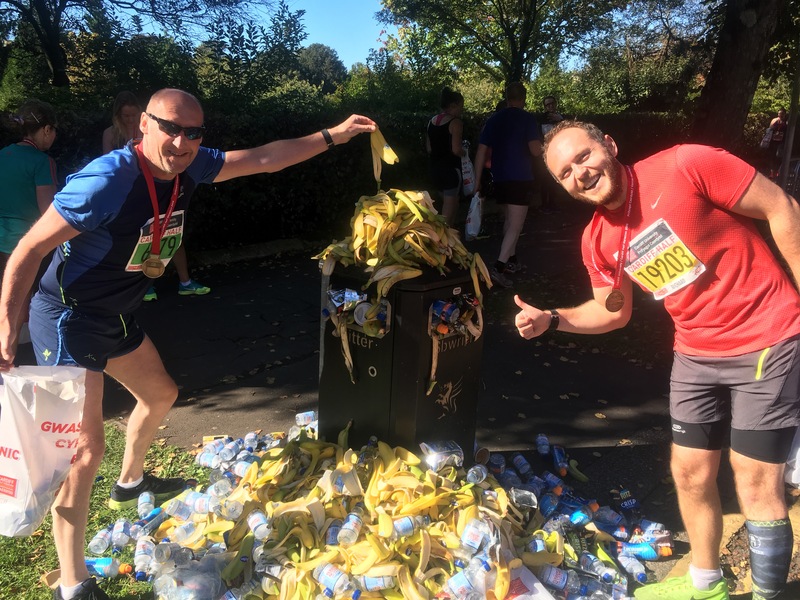 Now for anyone that tells you the Cardiff Half is flat are fibbing, well and truly fibbing. Yes I suppose it is relatively flat compared to other courses but there’s still a hill and one that we now have to run up. Surprisingly by the time we got to the top all my aches were gone. From our relatively newness to marathons, we saw the pacers for 2 hours 15 in the distance and thought if we could stay with them we could be within a chance of improving our time. As the miles disappeared we had all of a sudden not only caught the pacers but overtook them by mile 9!?!? Yes we were very surprised by this too. (Unfortunately,the pacers were no where near that pace, they were more likely on a 2 hour 20 minutes.) This gave us a huge boost and we pushed on, even after a guy dressed as a dinosaur ran past us. As we hit mile 10 we were now running into the unknown. We had both got this far once before but never crossed it. After a high five we pushed on only to be confronted by another hill (!!!!). Yes it wasn’t steep but it was still an incline that we wasn’t expecting. I reminded Hannah that what goes up must come down – although at this point she looked as though she wanted to punch me. Eventually we got to the top, turned the corner and there was the hill (more of a slight slope) back down. At this point we thought we were on the final leg & nothing stood between us and the finishing line 1 mile away. And that was it our first marathon was over, completed in 2 hours 21 minutes. Yes it was 9 minutes faster than we were expecting but we were disappointed not to break the 2 hours 20 mark. Upon meeting up with Chris again, our efforts were put to shame as he completed it in 1 hour 51 – a cracking job! All in all we were delighted, we have both ran our first half marathon, finished it ahead of our expected time & finished it together *mini fist pump*. Would I say it was hard – yes. Would I say motivating yourself to train is hard – yes. Did we cry, shout & throw tantrums whilst training – yes. Did we pick injuries & go through pain – yes. 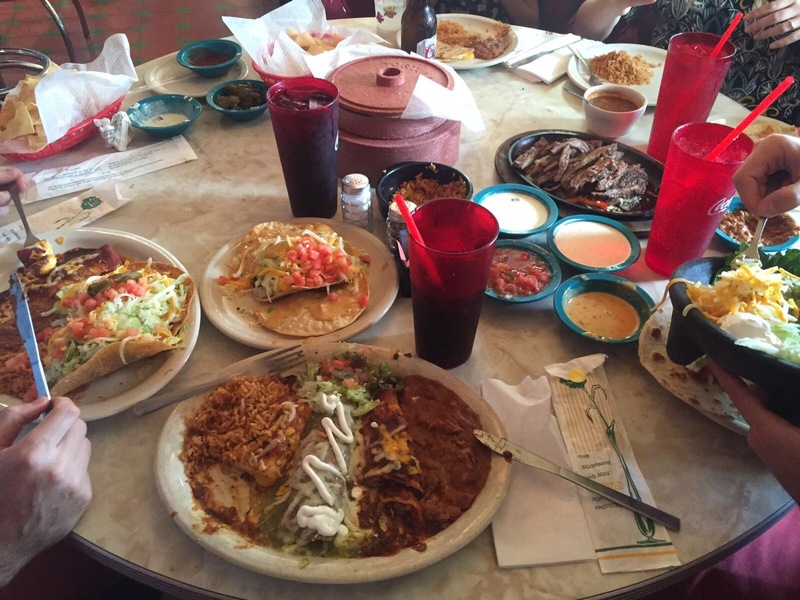 Would we do it all over again – ABSOLUTELY! Oh and a final shout out to the crowd. They were amazing!! If you ever go and watch a marathon make sure to cheer – it really does spur you on. It’s the day after our first ever half marathon and what an experience it was. All those hours & hours of running round & round culminated in what can easily be summed up as a long jog around Cardiff. I’ve hijacked Hannah’s blog to share my experience of the event. 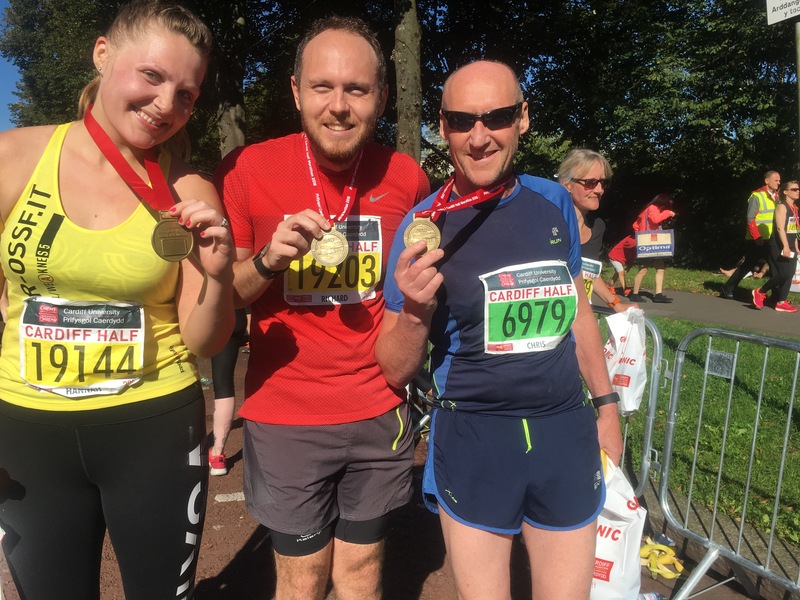 After watching Hannah’s step mum Sam complete the London Marathon this year, we got the buzz and decided to enter the Cardiff Half and just as quickly as we entered, we forgot all about it. It wasn’t until late July we realised we had better actually start training…! Now for anyone that knows me the only time I run is either in a game that involves a ball (mainly football or rugby) or running home from work where I can normally do it quicker than London transport. 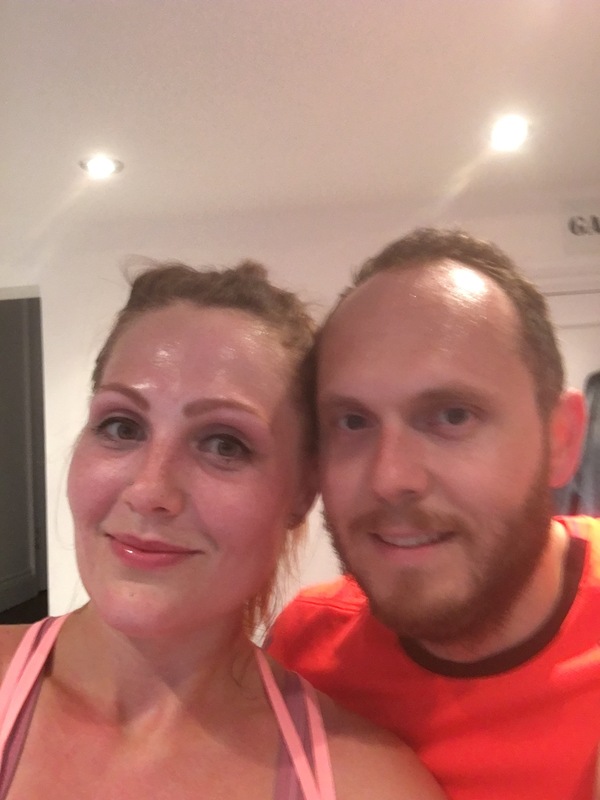 After initially doing a couple of quick 2 mile runs we eventually went out for a 4 mile run and realised the stupidity of what we had signed up for. 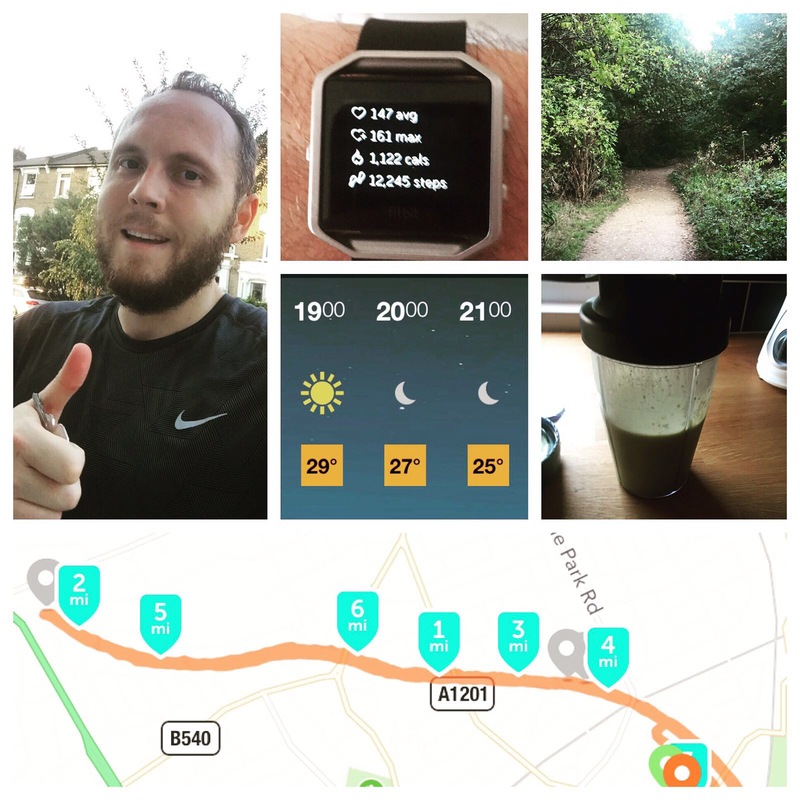 Getting to 4 miles was challenging enough after a summer of over indulgence and the thought of 13 – absolutely terrifying!!! Even our previous record of 6 miles looked a long way off at this stage. Over the weeks we kept at it (with a lot of nagging from Hannah) and eventually got to 7 miles before heading off for a 2 week holiday to Texas. The fitness came back slowly and I managed to get back up to 7 miles but after that – not a single mile more. I seemed to have a mental block at 7 miles and could never get any further, no matter what I did. I think boredom (running the same routes) came into play and combined with the stupid hot Indian Summer we were experiencing in London, I was struggling. It wasn’t until I read an article in Coach magazine regarding headphones & why you shouldn’t have them in Marathons I thought why not try a run without them. That night it was cool (for the first time in a long time) compressions shorts came out, a newly purchased calf support was on and I set out on an alternative route to what I normally took. Just over two hours later – BANG smashed a 10 mile run (just). Somehow not running to music or the annoying app telling me my pace every 10 minutes helped me focus on just my running. This was the furthest run I had ever done and would be before the Cardiff Half. This one single run gave me the confidence that I could run and finish the half which, up until this point I was worried – very worried. Unfortunately with our hectic lives I could only manage one more longish run after this and of course it had to be a 7 mile run. This time however I took 10 minutes off my previous attempt, finding that my stamina was a lot stronger and there were no aches or pains at the end. In the week leading up to the half we managed a cheeky 4 mile quick run and started carb loading or as we looked at it – eat what we want and tell ourselves it’s beneficial!! Marathon day blog to follow!